Meeting Called to Order by President Mary Straus. Pledge completed and invocation by Jo Holt. No song today. A sigh of relief by some, sadness expressed by others. Lori Malagone, M.Ed., Executive Director of Arizona Youth Partnership. This is the second week of visitation by Lori and hopefully she will be voted on by the board next Wednesday at the board meeting. Her sponsor is Tony Hunter. Mary Franco, Principal, Open Doors Community School, presented today and also indicated to Randy that she would like to join our club. (I suggested that she go to the website and download an application). Sponsor Mary Straus (I think). Richard Benner, Jr., Field Director of the Boy Scouts of America has now had his application in for two weeks. I called his today and asked him to attend next week so the board can vote on his application. Sponsor is John Dooling. I think this is the first time, in my knowledge, that we have had five potential members in the chute for admission to the club. To make up for it we sang Happy Birthday to Joe Farr who celebrated his 27th birthday. A reminder: Dues are not being collected … don’t make us send an enforcer to collect from you. Some of you also received an invoice for Every Rotarian Every Year (EREY). It is only $100.00 per year make your donation as soon as possible to the “Annual Programs Fund.” So we can get some of that money back for projects in three years. District Conference attended by President Mary, Don Jorgensen, Jo Holt and Randy Brooks. Jo attended sessions related to Youth Services. Don and Randy attended the Grants Management Seminar (this qualifies us to pursue a District or Global Grant in 2017-18. Don encouraged the club to look into a district grant. “It’s sad to leave money on the table.” The decision (in rough form) must be submitted to the district by July 15 or we will be ineligible to apply. Mary, Don and Randy gave out cookies at the district conference. Both were warmly received. 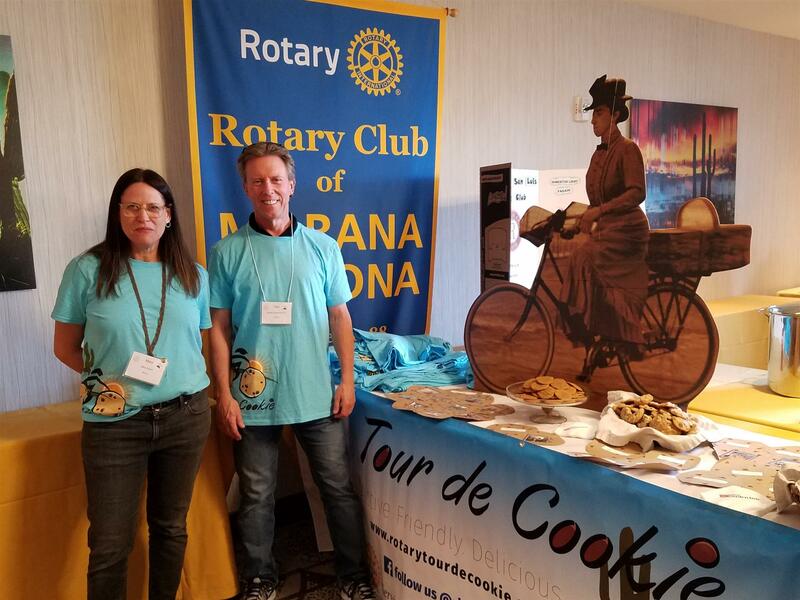 Thank you to Mary and Deb Hume (Randy’s spouse) for baking cookies and to Dan Contorno for suggesting we hand out the 40 Tour de Cookie T-shirts. It was really fun. Don announced that the Rotary Club of Marana and the Rotary Club of Dove Mountain Marana are two of the top three giving clubs to the foundation so far this year. Our club gained a tremendous amount of notoriety and respect at the District Conference. We are truly one of the absolutely best clubs in the district. Maeve suggested we collaborate with Marana Health Center and have Clint help us. Mary suggested we consider TROT … an organization that provides equine therapy to children with autism and adults struggling with emotional issues. I have seen these efforts help dramatically with veterans with PTSD from combat. If you have not visited our website. Please do so. Harold Burtzloff did the work and he did a great job. Thanks Harold. I am sure I missed some of the announcements today but here are a few: Don is celebrating his 38th Wedding anniversary this week. Xavier is celebrating an anniversary as well (did not get the number), Dan and Heather are celebrating 15 years of wedding bliss. Harold has been a Rotarian for 48 years, Tony and Clint have been members for one year. Don is celebrating 9 years in Rotary. May 4, 1987 is the anniversary of women in Rotary. Mary read the Council on Legislation history of “shame” (my word) in rejecting for scores of years the entry of women into Rotary. The Supreme Court made the final decision for those in the USA. Sylvia Whitlock, a Governor classmate of Randy was the first woman to enter Rotary. She is and was a psychotherapist and to this day is an example for all of us. Mary, Maeve, and Randy told stories of the struggle to introduce women into Rotary. Don suggested we watch TNT on Thursday nights to see how the FBI operates in New York City. The film is just one year old and in interesting in that Don and Kathy’s daughter is a FBI agent in New York. Maeve announced that her daughter and granddaughter are doing great now…. Hooray! She then told a joke about a pirate that was being driven nuts. Sigh. Guest speaker: Mary Franco from Open Doors Community School. 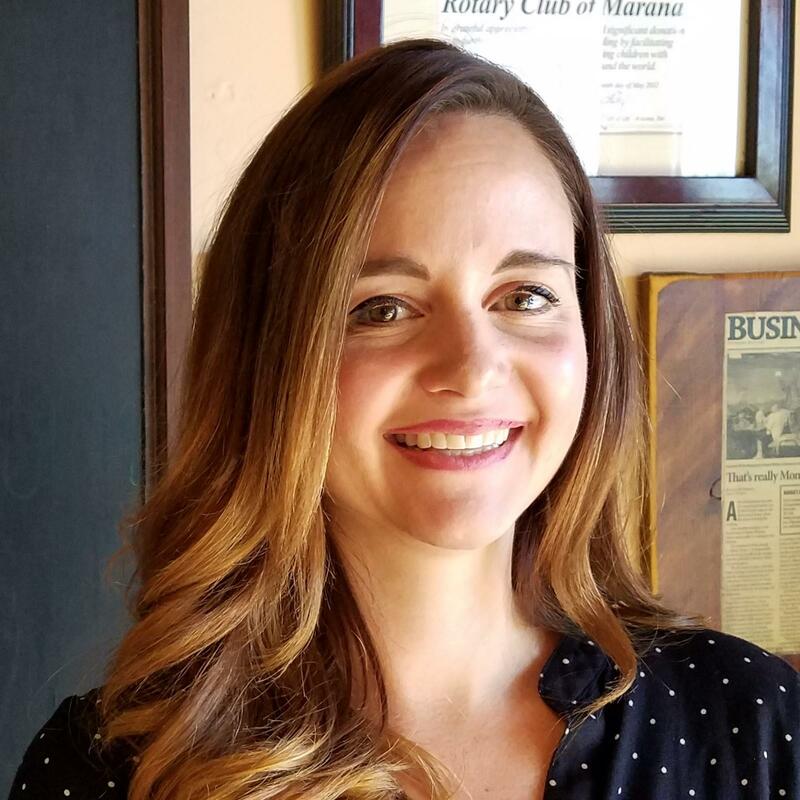 She holds a master’s degree from the University of Phoenix and is a current doctoral student. Raised on a farm in Bisbee she was encouraged by both of her parents to become an educator in their footsteps. She has three children and was principal of the middle school she attended as a child. Meeting closed with the 4-Way Test.